A few years back I was sitting in the FBO at KOAK – Oakland Intl. watching a G550 crew go through what looked like its preparation for a flight. After their APU was up and running a crew member came in to inform the front desk that their passengers should be arriving in 10-15 minutes. I shared the same perplexed look the customer service representative gave him because the field was shut down for the next two hours. “Sir, the POTUS is in the Bay Area and with the exception of the airlines, no one is getting in or out due to the TFR,” reminded the woman behind the counter. The pilot said nothing, as her comments didn’t seem to register, and returned to his plane. Right on time the passengers came into the lobby and went straight for the plane. Many of us in the lobby just watched in curiosity; what golden ticket did these pilots hold? Baggage was loaded, cabin door sealed shut, 3…2…1…engine start. With both engines running, one line service technician turned on the ground control frequency to listen in. The flight crew called for taxi and the controller simply stated no aircraft were allowed to takeoff for at least the next two hours. Several back and forths occurred over the radio and a few moments later the engines spooled down and the cabin door opened. I tried to think of excuses in my head as to why the crew weren’t aware of the TFR, but I couldn’t, nor was I about to ask them as they seemed a bit red in the face. A few years prior to that, I was sitting in another lobby catching up with a friend at KBFI – Boeing Field in Seattle. We were admiring the clean lines and paint of the President’s 747 parked just a few feet away when we heard what sounded like two explosions in quick succession followed by some rumbling. Given, there was a railyard just a quarter of a mile away, but this was too loud for train cars linking up. A few minutes passed and everyone’s rubber necking curiosity subsided and they went about what they were doing before. Later that afternoon the local news reported that two F-15s from Portland were scrambled to intercept a single engine plane that had just entered the northern shelf of the TFR. The sonic boom was in fact the F-15s as they reached the Seattle area in just minutes…something I’m sure the flight crews were hoping they were going to get to do that day. As details unfolded over the next few days it turned out the pilot simply wanted to take advantage of the good weather and go for a loop north of Seattle. He entered just the first mile or two of the TFR, but it was enough for me to check off hearing a sonic boom for the first (and maybe last?) time. 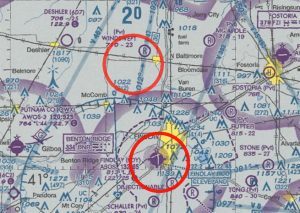 These two stories are merely pages in an encyclopedia of TFR violations that have occurred in the U.S. TFRs can be fickle, and because of this we need to check them frequently. In just this past year I have seen TFRs for the POTUS, forest fires, baseball games, airshows, and seismic disasters. Each of which may come with a few days’ notice or just a few hours’ notice. It is admittedly hard to get in the habit, but a bookmark in your web browser or an app on your phone takes all but a few seconds to check. An even smarter option would be to obtain an official briefing. That way if a TFR does pop-up without your knowledge you do have a record of checking for TFRs. Weather, TFRs, NOTAMs. Repeat. Weather, TFRs, NOTAMs. Become familiar with all available information pertaining to your flight and you will be free of the embarrassment and, more importantly, the repercussions of busting a TFR.